LONDON (Feb 27): The dollar edged up from a 2-1/2-week low against the yen on Monday, but struggled to gain traction elsewhere, as investors awaited a speech this week by U.S. President Trump for clues on his economic agenda. Trump is set make his first major policy address to the U.S. Congress on Tuesday, and is expected to give some details on his planned infrastructure spending and tax reform. But market participants worry that if the plans laid out are too vague or look slow to execute, that could weigh on a dollar that reached 14-year highs earlier this year on the back of the "Trumpflation trade" — a view that Trump's policies would shore up inflation and growth. "The market is still waiting for further details of President Trump's economic stimulus plans, including looser regulation, comprehensive tax reform, and higher infrastructure investment," said MUFG currency analyst Lee Hardman, in London. "If (he) fails to provide further reassuring details in the address, the market is likely to be left disappointed, which at the very least could prompt the market to push back the timing of likely stimulus beyond this year," he added. Treasury Secretary Steven Mnuchin said on Sunday that Trump will use the event to preview some elements of his sweeping plans to cut taxes for the middle class, simplify the tax system and make American companies more globally competitive with lower rates and changes to encourage U.S. manufacturing. Having hit a low of 111.92 yen in early trading in Asia, the dollar was up 0.3% at 112.29 yen by 0845 GMT. Against a basket of major currencies it was flat at 101.15. Economic data on Friday put pressure on U.S. bond yields and the dollar, showing new home sales grew less than expected in January and consumer sentiment weakening. But speculators have not counted the dollar out. 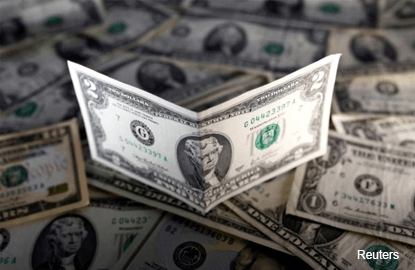 They increased bullish bets on the U.S. dollar for the first time in seven weeks, according to Commodity Futures Trading Commission data released on Friday and calculations by Reuters. The euro edged up just 0.1% on Monday to US$1.0575, as concerns that far-right anti-EU leader Marine Le Pen could win France's upcoming presidential election continued to weigh on the single currency. Despite another raft of polls showing Le Pen losing either to centrist Emmanuel Macron or the right-wing Francois Fillon, investors, mindful of the shocks of Brexit and Trump's victory, have not counted her out, and many fear that she could lead France out of the euro zone. "The changes in the polls perhaps won't be listened to, because people just don't trust them," said Rabobank currency strategist Jane Foley, in London. Sterling skidded to a twelve-day low of US$1.2384 on a report that Scotland is preparing to call another independence referendum, when formal Brexit negotiations are triggered in March.